If you have ever gone for a period where sleep has been difficult or disturbed, you will already know how much it can affect you in every part of your waking life. Whilst one or two nights with too little sleep can lead to tiredness, grumpiness and a loss of focus, it doesn't do your overall health much harm. However, poor quality sleep for longer periods starts to become more serious. Lack of sleep makes it difficult to concentrate and make decisions, can make you start to feel down, and can cause you to fall asleep during the day. You become more likely to make mistakes or have accidents, too. If it continues, poor sleep can have a much bigger impact on our health, too: "Regular poor sleep puts you at risk of serious medical conditions, including obesity, heart disease and diabetes – and it shortens your life expectancy." (NHS Choices). And when this is coupled with grumpiness, poor decision making and lack of concentration and focus, it starts to impact on your relationships and family, too. So when my own sleep deteriorated to almost none (a few hours a night at best, unless enhanced with chemical sleeping tablets), we knew something had to change. Sleeping tablets can help, but really only for a short period and they are something I really didn't want to use for long. Thankfully help was at hand, and we were sent an S+ to review. 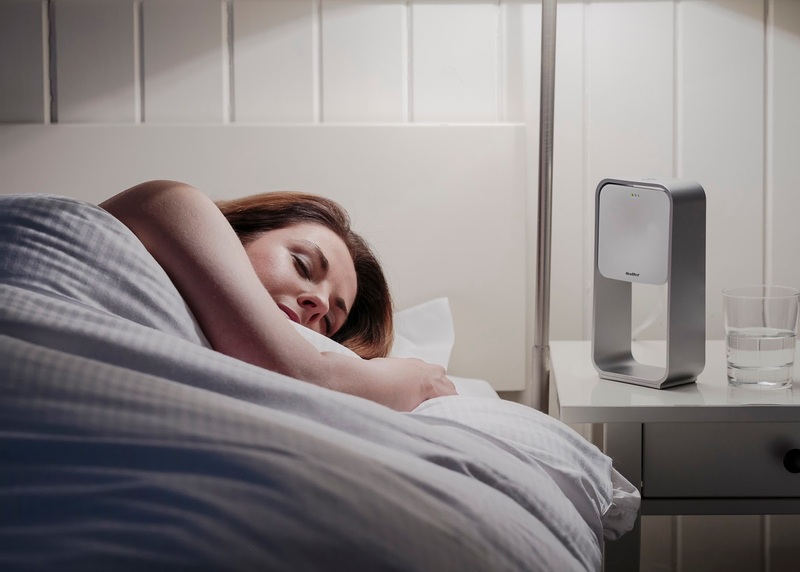 This new device both monitors your sleep, and then provides tips and advice on how to improve your sleep. 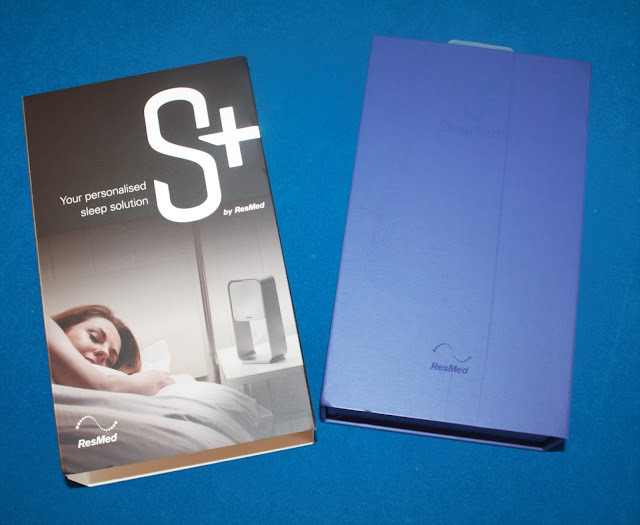 The S+ comes in a very smart box, giving a flavour of the quality and style of the product inside. The unit itself is almost a work of art, a simple cube with a curved white front. We used the stand, to make the unit taller, and this simple loop adds to the elegance of the S+. 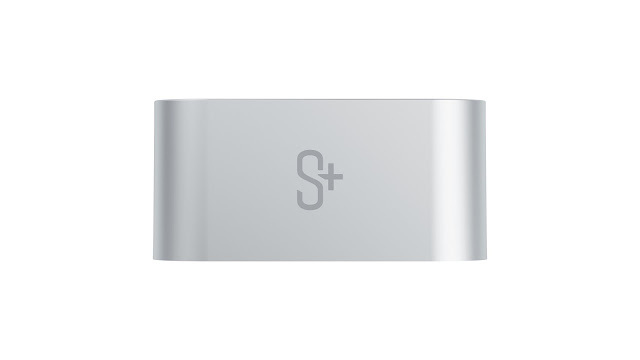 The power plug for the S+ has a second USB power output so you can charge your phone or tablet overnight alongside the unit, which is very handy as the S+ talks to your phone throughout the night to record your sleep pattern. Be aware that the S+ plug power output is not suitable for an iPhone or iPad, although this wasn't a problem for us as we simply used the second plug in our room. First impressions, then - a very stylish, quality-looking product. Once out of the box, setting up the S+ was very simple, and the instructions in the box made it even easier. There were two sets of instructions - the full set (who ever reads them anyway?) and the quick guide. I used the latter, and it was more than simple enough to follow. For the purposes of the review I also looked through the full set, and they were also quick and easy to understand. The first step is to download the app onto your own iPhone/iPad or Android device (clearly not included with the S+). We actually put it on an iPad and my Android phone and both worked just as well (although you can only use one at a time with the unit, otherwise it won't know which to talk to). Once installed, the app guides you through the next steps. 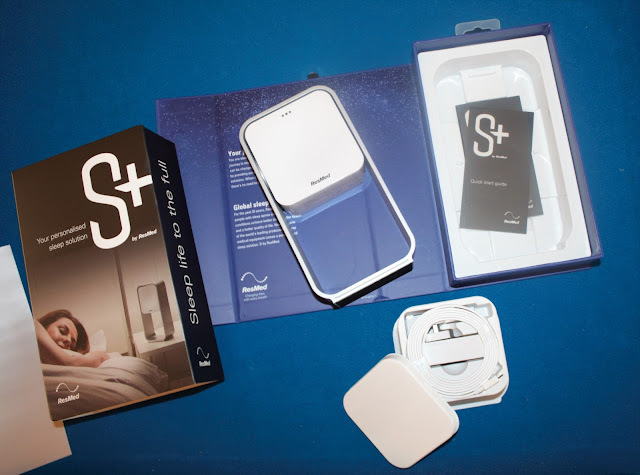 Put the S+ in the bedroom next to the bed, plug it in and connect it via Bluetooth to the phone or tablet, following the instructions on-screen. During the setup you have to create an account. This was just a few simple questions, and proved invaluable later as once you have an account, you can access the information from any device where you have the app. So we used the iPad to connect to the S+ overnight, and reviewed advice on my phone when we were out and about later in the day. Setup, then, was really easy - much simpler than many other apps or health monitoring tools I've looked at before. In normal use, the S+ has a very simple screen. The top half shows the sleep data from the last sleep (overall score, REM recharge score and Deep sleep recharge score); clicking here gives more details about the scores. The bottom is where you can take action. For the first few nights, the focus is on the big button at the bottom of the screen. Hit that 'Sleep' button and four quick questions appear - asking about stress, exercise, alcohol and caffeine. Answer those, hit 'Good Night' and you're off. 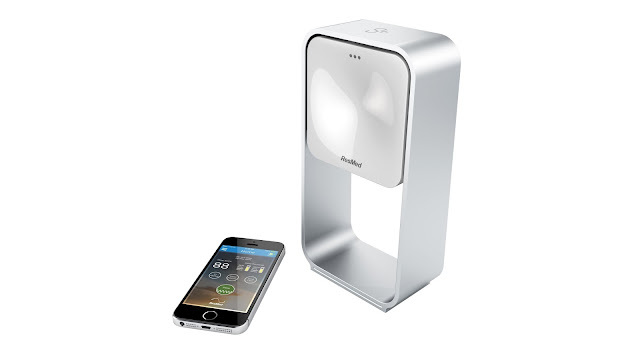 The S+ has an array of sensors that monitor sleep patterns, breathing, light and sound. They are really sensitive, and just before hitting that final 'Good Night' button it shows your current breathing pattern. Once in the 'sleep' mode, the green light on the S+ unit dims, and it starts monitoring your sleep. It sends the data via Bluetooth to the phone or tablet, which records everything throughout the night. Three brilliant features that are activated during the sleep mode are designed to help with getting to sleep and staying asleep. The first is Mind Clear. You know those annoying thoughts that pop into your head whilst you are trying to fall asleep and won't go away? Mind Clear helps deal with those. Hit the button, then either record a voice memo or type a text memo so you no longer have to remember it, then get back to falling asleep. The memo is ready for you in the morning when you wake up. The second is Relax to Sleep. You can choose from a range of gentle rhythmic sounds that help focus your breathing and calm and relax you. Our favourite is Shoreline (waves gently breaking onto a shore) but there are 9 or so to choose from. The app plays the sound, whilst the S+ monitors your breathing for a couple of minutes and then gently synchronises the sound to your breathing to aid relaxation. The third is Smart Alarm. During normal sleep there are three phases - Light, Deep and REM. The best and most natural time to wake up is during a phase of Light sleep. You tell the app when you want to be awake by, and a window of 15-30 minutes before that during which you are happy to be woken. If you enter Light sleep during that period before the alarm is due to go off, you are gently woken through the app. Again there are a range of different alarm noises to choose from - a jungle backdrop proving best for me. If the alarm time is reached before you get into another phase of Light sleep, the alarm will go off anyway - so you won't be late for the bus! For the first few days, the S+ monitors your sleep each night without giving recommendations or tips. This is so it can detect patterns and give overall guidance. Our verdict on the app and S+ at this point - they're great! Very simple to use, clear instructions. Very few buttons on the app (and none on the S+ itself) making it really easy to follow. The Relax to Sleep has been really useful (and it can be triggered during the day just to help you relax). Unfortunately our kids don't have inbuilt Smart Alarms so tend to wake us for one reason or another before the S+ can do so gently. The Mind Clear has been good, too - a sophisticated notepad by the bed, but much better as it allows voice memos to be recorded, so avoiding the need to grab a pen or type a message (which I am incapable of at night). Once the S+ has recorded a night of sleep, it gives you three scores. The first is you overall sleep score, the second is the REM Sleep Recharge score, and the third is the DEEP Sleep Recharge score. These are calculated based on the duration and quality of the phases of sleep and how they interrelate. They are important because REM sleep helps restore your mind, and Deep sleep helps restore your body - both matter. The overall score gives an indication of the quality of your sleep overall. All three scores are out of 100. Pressing the score on the app then gives more details. My first night using S+ was surprising - I got 94 overall (98% REM and 100% Deep scores), although I did get 0 out of 5 points for my onset of sleep (it took an age to fall asleep, but then was pretty good quality through the night). That was one of my high points, though, with my overall sleep score moving about a fair bit and hitting 70 one night. After a few days, the S+ has built up a pattern of your sleep and can start offering advice. This can then be accessed at any time from within the app - not just today, but into the future, too. For me, this advice included suggestions such as taking some exercise (for a few days we didn't do our normal walk as the kids were off sick from school) as exercise helps improve sleep; or taking a hot shower 90minutes before going to bed (as your body cools, your sleep drive accelerates). Each tip is short and simple, but has a link to the S+ website for more information. 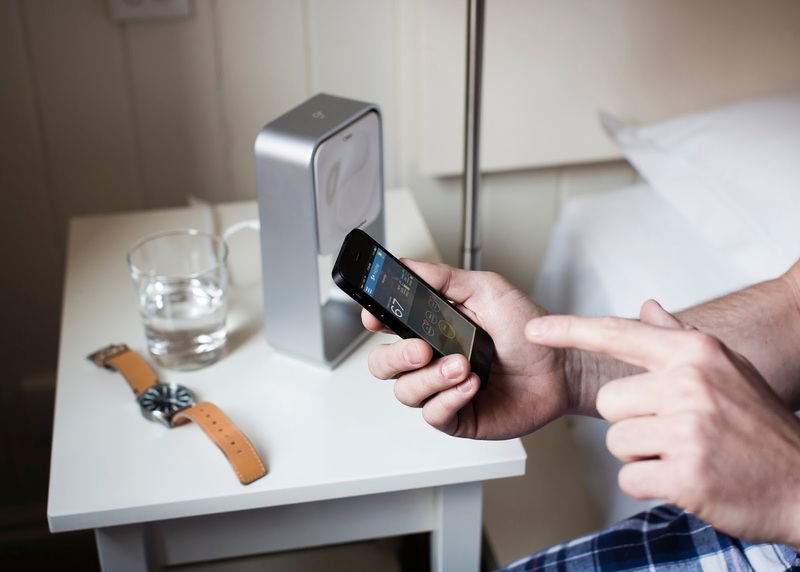 So the S+ is a stylish and elegant unit that sits by your bedside and monitors your sleep. But it does much more than just watch. By building up a pattern of how you sleep, the S+ (through the app) gives tips and advice on how to improve your sleep. I have to admit, I was a little sceptical at first - the S+ unit is just a box with no obvious technology in it! But I have been won over - the beautiful little box is full of hidden tech watching light levels, breathing, movement and temperature then feeding that all through to work out what phase of sleep you are in. The monitoring has been really interesting - seeing a picture of your sleep phases each night along with scores of how well your physical and mental batteries have recharged becomes a little addictive! The Relax to Sleep function has also helped - simple soothing sea waves playing gently in time with your breathing really does seem to help aid relaxation, and of course the better relaxed you are the easier it is to fall asleep. I've also found the Mind Clear tool useful - saving having to find that pen then remember how to write as you are trying to fall asleep! Some of the tips have been good, too. Little suggestions that, over time and combined with each other, will lead to better sleep. At this point, I've only been using the S+ for ten nights. I've looked at my sleep scores each day, and they do jump around a bit - one off-night can make a jump. But (call me a nerd here) when you look at a rolling average over five days (to iron out the one-off blips), my overall sleep score has improved (88% to 92%), and my REM sleep has improved markedly (82% to 91%). My Deep sleep hasn't increased, but is hovering around the 88% mark. So, numerically it does look as though my sleep is better. And physically - how do I feel my sleep has been? Well, I think it has improved over the past couple of weeks. It's early days, I guess, but I have had longer sleep and fallen asleep more quickly than I used to. The combination of monitoring my sleep (which helps by reassuring it isn't as bad as you might have thought!) with the tips (helping give advice on improving sleep patterns over time) and the Relax to Sleep functionality has helped. Would I recommend the S+ to you? Here at The Beesley Buzz we only recommend products we would be happy to use. And I happily recommend the S+ to you if you need help improving your sleep, or just want to monitor how well you are doing. The S+ by ResMed is available from Amazon and more information is available from the ResMed website. Disclosure: We were provided with an S+ by ResMed for the purposes of review. All opinions are our own. On this site I use affiliate links. This means that, at no cost to you, I may receive a small payment if you buy something from a site I link to. I only recommend and link to products, services and companies that I am happy to promote. Some images used in this post are courtesy of ResMed. Image from one of the stop-frame animations in Poochy & Yoshi's Woolly World. 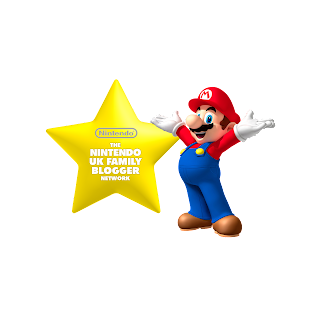 Image courtesy Nintendo. Poochy & Yoshi's Woolly World is the latest game featuring these two cute and cuddly characters. Out now on the Nintendo 3DS, the game includes all the stages from Yoshi's Woolly World for Nintendo WiiU as well as a load more content and exclusive Poochy levels. And, being on the Nintendo 3DS, you can now play the game wherever you like. And, of course, you can use your amiibo to unlock new features or play with skills from Mario, Donkey Kong and others. Just as in the original game, most of Yoshi's world is made of yarn... as are most of the Yoshi's as the nasty villain Kamek has used his magic to turn them to wool. By travelling through the different levels and worlds, Yoshi must set off to rescue his friends. 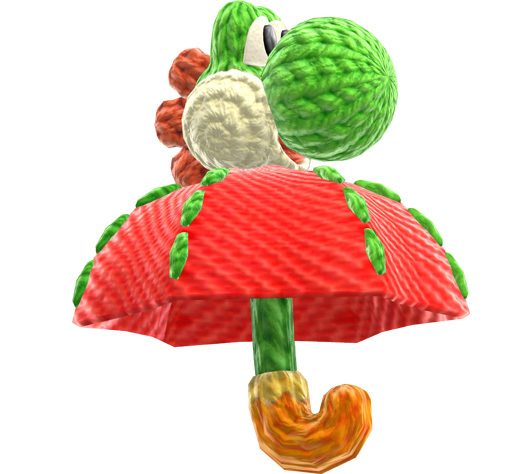 There are hidden doors (revealed by unravelling the wool) and secret areas where Yoshi can be knitted into a different form (such as the umbrella Yoshi below). Poochy & Yoshi's Woolly World is like Yoshi's Woolly World but it is a bit different. There is a Yoshi theatre where you watch a short video and answer a question about it to get gems. In the Yoshi Hut you can choose to play as a different type of Yoshi, or you can create your own Yoshi. There are two things you can do when you create your own Yoshi. You can choose easy mode or professional mode. 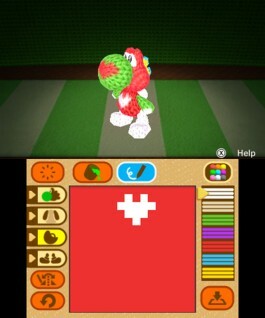 In easy mode you can choose a craft material or choose a design for Yoshi's whole body. In professional mode you can choose separate colours and patterns for every part of your Yoshi. This is a great, fun new feature. In the Poochy Hut you can play mini games as Poochy. You have to try to complete missions and collect the Poochy pups. Sometimes when you complete the level you will get a Poochy Gold Dash. This means that all the gems in one game of Poochy Run are gold. If you play the levels in mellow mode you can choose to use the Poochy pups. You can throw the Poochy pups like yarn balls, but they also help you to attack enemies. They also show you secret areas and bark when there are yarn balls nearby. There are also power badges that you can use. You can choose whether you want to use the Poochy pups and you can switch to this mellow mode during a level. I enjoy this game lots and I give it 10 out of 10. In Poochy & Yoshi's Woolly World, there are adorable Poochy Pups who help you find secrets, hidden areas, and loads of coins. Don't forget to do the Poochy Gold Rush where you try to get as many coins as you can as Poochy. So, the verdict is that this is a great, fun, and exciting game. We love how the Poochy Pups make an appearance, and help to make levels easier to complete, and enjoyed designing our own Yoshi's. If you enjoyed Yoshi's Woolly World, you will love this. And if you're looking for a fun, entertaining platformer full of cute and cuddly characters, look no further - Poochy & Yoshi's Woolly World on Nintendo 3DS is for you! As Nintendo Family Bloggers we were sent a download copy of Poochy & Yoshi's Woolly World for Nintendo 3DS for the purposes of review. All opinions are our own. MRI update - Should my child have an MRI without general anaesthetic? Monday was a bit of a milestone for Miss T. Although it was her third MRI scan having had two done previously on her legs - one as part of the diagnosis process when she first had Juvenile Arthritis and one done to check how things were progressing when her foot seemed swollen last summer, this was the first time that she had an MRI without sedation or anaesthetic. I remember driving her to our local hospital for her first MRI scan back in early 2015. I remember feeling tearful doing that early morning drive with the sun shining brightly and wondering why my little girl had to go through this at that young age. I remember the nurses being amazed at what a calm and happy kid she was. They didn't often come across such relaxed toddlers. The nurse contemplated doing the MRI without sedation even back then when Miss T was just two. But the risk of her getting freaked out and then having to go through it all a second time was too high so they did the sedation. I remember feeling unsure of how quickly it would take effect. 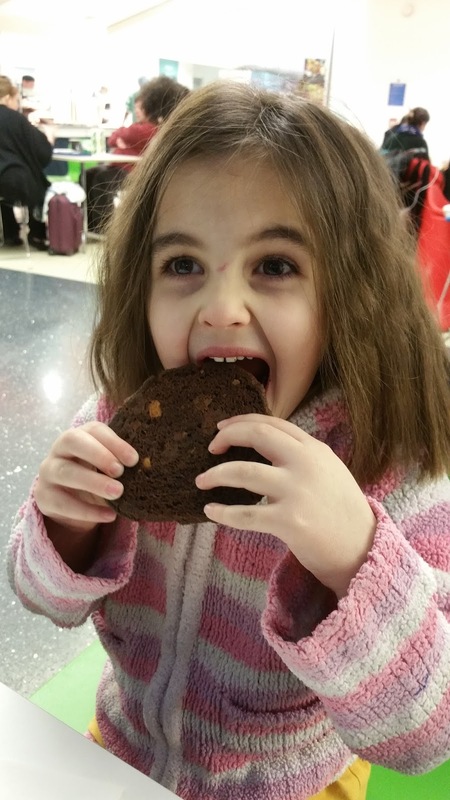 I hated seeing my happy little girl suddenly become grumpy as the tiredness hit her. Nothing distracted her and in the end I just lay on the bed with her until she fell asleep. Then it was down to the MRI room. I wasn't allowed in. I wish I could have been. I sat outside and read and tried to distract myself and waited. Then it was over. She was crying - I could hear her. Then I was allowed in. Back up to the ward. She was given some food and monitored for a while and then we could go home. The next time it was her consultant at Great Ormond street who requested it. So it was up to Great Ormond street - this time under general anaesthetic. Miss T was older. It was last August. She was 4 years old. Her consultant knows how calm and relaxed she is and so had anticipated that the MRI could be done without any sedation or anaesthetic. However the MRI team had made plans to do it under general anaesthetic and it didn't feel like we got a choice in the matter. This time her consultant had insisted that she was able to lie still for the 40 minutes it would take (two lots of 20 minutes with a break in between). Although we know her well enough to have hoped that she could do it, she is still just a 4 year old kid at the end of the day and if she had felt worried or confused then it could have all gone pear-shaped. Daddy was allowed to stay with her the whole time. She had taken The Bee Movie DVD to watch whilst in the scanner. All went smoothly. But my brilliant little girl did it! This photo shows her with her massive chocolate cookie straight after the MRI - Smiles all round, no grogginess or sleepiness this time. I wish we'd fought her corner more before but at least now we know that if she needs an MRI again, she CAN do it without sedation or anaesthetic. Being stuck at home last week with back pain seems to have put me in a reflective mood. A few days ago I met up with an old work colleague who I hadn't seen for a whopping 12 years. So much has happened, so much has changed in those 12 years that manage to seem both such a short and long time ago. The last time my friend had seen J, he was just a teeny baby just a few weeks old. This year that little baby will become a teenager. He's camera shy these days pulling silly faces every time the camera comes out, hence the most recent photos of him are from Christmas Day complete with his angry birds eyebrows on! J loves gaming, gaming and more gaming. He loves wearing onesies but in the absence of one that fits him at the moment he's making do with Christmas jumpers as his favourite item of clothing. He's mega studious and is thriving at school - a miracle Given his difficulties during his early school years. Next up, D... the cool, calm and collected chef of the family. At 10 years old he often shows wisdom beyond his years...understanding, caring, responsible. His attitude to his studies has transformed this year with his awesome teachers praising and encouraging his achievements - he's become super motivated. His patience was put to the test last September when the day after we got back from Dubai and the day before year 6 of school began, he had a mega bad fall and broke his wrist. Wearing a cycle helmet prevented his injuries from being a lot more serious. Despite his frustrations of not being able to ride his bike or do sports for several months after, he actually found ways of doing some of his favourite things like cooking! You can see him cooking with his plaster cast on here! We also managed a trip to Legoland as soon as his arm was out of plaster. Guitar is his instrument and he was really glad to get back to that. Most recently he's been getting into wildlife photography - a hobby he's been learning along with daddy who's also learning from a good friend. And last but certainly not least, Miss T. It was her move to a 'big bed' on Friday night that prompted me to write this update in the first place. She's been in a cotbed until now and as she turns 5 this year we knew the time was coming for the move. When a friend kindly gave us their old mid–sleeper for D we reshuffled his bed into Miss T's room. All it needed was a new mattress. Whilst I knew I wanted a good quality pocket sprung mattress for her, I didn't want to spend a fortune because, kids being kids, it could end up with accidental damage at some stage. I was wary of buying on Amazon or eBay as we've been caught out before with items looking too good to be true (they usually are) but when I spotted a reasonably priced one on Wayfair, I felt confident enough to trust them. That's where the blogging world really does make an impact on brands - I knew that a blogger I trust (Penny Alexander) has worked with Wayfair and so by association they became a trusted brand to me and hence that's where we bought Miss T's new mattress from. We opted for this pocket sprung mattress and so far it has proved to be a brilliant find. It čame vaccuum packed (great innovation!) and certainly upon initial use seems to be great quality and ticks all the boxes. Miss T was excited by moving to a big bed and had a great nights sleep. She still uses her grobags (I bought the big size that can last up to age 10) - although I don't anticipate that she'll use them up to that age, for now they've served us really well in helping Miss T stay settled at night and not keep getting out of bed as we experienced when J was younger! As her warm grobag was in the wash, here she has her lightweight one with an additional lightweight cover too that her lovely godmother made for her for her dedication. So that's a little update on my (not so little anymore) family. Something I've neglected updating for far too long on the blog. I love to be inspired by my ingredients when creating a recipe. I know some people love to plan ahead or meal plan for the whole week, but I love nothing better than to wander around the supermarket aisles and pick up ingredients that are in season or that catch my eye in some way with their naturally vibrant colours, their freshness or their unique provenance. And this time of year I find myself longing for Spring - so I love to find ingredients that show any little hints that Spring is on the way and that can brighten up my day in the meantime. Foodies100 and Tesco Cypriot New Potatoes have challenged bloggers to come up with a recipe using these wonderful little potatoes that are in season from now until the end of March. Having started on a healthier eating journey last year, I was keen to stick to lovely healthy ingredients in this recipe. The zesty lemon dressing really brings all the ingredients together and gives it a lemony-zesty kick. So don't miss that part out! 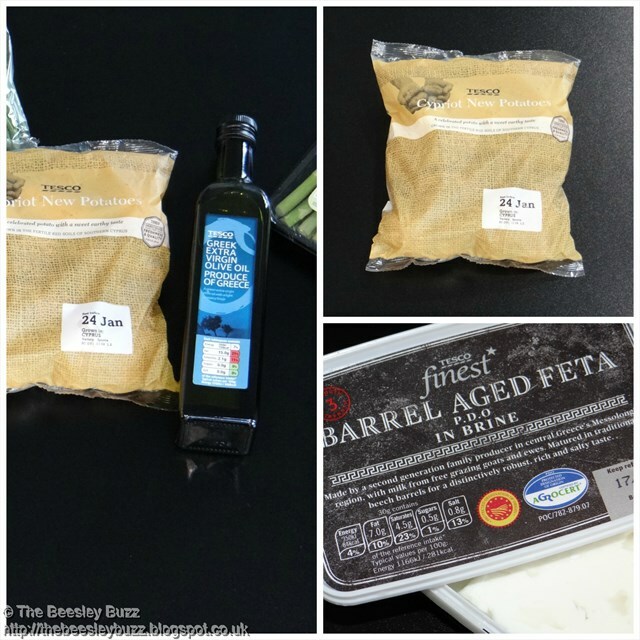 Back to the main ingredients...Tesco kindly sent a voucher towards the cost of ingredients and as well as the Cypriot New Potatoes, a few other unique items caught my eye...including this Tesco Finest Barrel aged feta. I knew that the Greek extra virgin olive oil would be perfect for my dressing. So along with a few other ingredients I was all set to go. Before I list the full ingredients and method, I thought it would be fun to show just how easy this recipe is to make in a little video. We had fun making it, so I hope you enjoy watching it! Whilst this is a 'salad' with those lovely feta pieces and tasty greens it really makes a yummy complete meal. This salad is flexible enough to work well if you fancy adding in some flaked cooked salmon or chicken. The potatoes, greens and dressing really make it but everything else you can switch about and experiment with as you wish. 2. Wash and blanch the asparagus and green beans. They will need only a minute or two in boiling water and then run under cold water to keep them bright and green looking. 3. In a large bowl toss together the rocket, tomatoes, Cypriot new potatoes (cut any that are too large in half), the asparagus and the green beans. 4. Crumble the feta over the top. 5. Make the zesty lemon dressing by mixing together the zest and juice of one lemon with greek olive oil and salt and pepper. Make this in whatever proportions you like. Any leftover dressing can be stored in the fridge for a couple of weeks. 6. Drizzle over the salad and enjoy! The great thing about this dish is that by using the potatoes whilst they are warm will give you a warming element to it in the winter months and yet in the summer months the potatoes can be left to cool to make a brilliant summer salad. This post is my entry into the Foodies100 / Tesco Cypriot New Potatoes recipe challenge. Full details can be found here. Tesco kindly sent a £10 voucher towards the cost of ingredients for this blogpost. Having fun with these Cypriot New Potatoes from Tesco! I have backache everyday. It isn't pleasant but it isn't unbearable. Maybe I've grown used to it. The morning stiffness. The constant niggle knowing things aren't right. The mechanics of my back not aligning as they should. Relying on medication every single day to keep the pain at bay and to ease the inflammation and stiffness. Back Pain is different. Backpain isn't an annoyance - it is agony. Backpain robs you of joy, changes your personality. Feeling beyond grumpy because the constant intense pain makes it too much effort to smile or make small talk. Everything is difficult. In some cases impossible. Things normally taken for granted - sleeping, walking, preparing a meal, sitting and watching TV. All unbearable. It's unbearable to lie down to rest, it's unbearable to sit up, it's impossible to find a comfortable position. I've had back ache for the best part of 30 years since being diagnosed with juvenile arthritis at the age of ten. But backpain has come and gone in intense flare ups at varying intervals. Sometimes the simplest thing can trigger it - attempting to do my shoelace up, helping strap one of the kids into their car seat, walking a little too far or a little too fast. This time it was swimming. I'd taken my rheumatologist's advice to swim more instead of just doing my usual stretches and movement exercises at the hydrotherapy pool. I did have my reservations because I have spent 30 years getting to know my body's limitations. Often the hard way. But the promise of the possibility of one day being able to reduce the daily pain relief medication was enough of a lure to try. Swimming is often recommended as a great form of exercise for arthritis sufferers. Doesn't have the stress of joint impact the way other exercise does. It is considered to be a gentle form of exercise. Particularly in a hydrotherapy pool where the warmth of the water can help. But when my hip joint is worn and warped and distorted, when it is my hip joint being misshapen that has taken its toll on my back in the first place, then swimming with my hip movements being not as they should be puts strain and stress on my back. For the past two days I have been housebound. Living off freezer food and unable to keep on top of even the most basic of chores - putting the washing machine on, doing the washing up, preparing any food - all causes too much pain to even attempt. I feel so frustrated and helpless not being able to look after my family. I can now understand why the elderly sometimes have that characteristic penguin shuffle when walking along. It is not (as I had previously surmised) fear of falling, it is back pain as I have only been able to move around the house with that same penguin shuffle movement. My family have had to help me get dressed. They've had to tuck my chair in at the table. Brushing teeth has been agony. Any movement requiring even the slightest lean leaves me crying out in pain. And when I'm like this, I can't imagine a future where I'm better. I think that this is it now for life. I clear my diary knowing there are things I now cannot do. The words from an arthritis advert I saw many years ago ring out in my mind ...arthritis won't kill you but it can take your life. But I need to remind myself, I've been here before. I will probably be here again at some point. But I will get back to being my own kind of normal. Where I can have my own normal life back, albeit full of limitations compared to someone else's. But give me backache rather than backpain anyday.